At Morgan Murray Stoneworks, we produce high quality Memorials in both traditional and contemporary designs, variety of colours and sizes. Great care and attention is taken in the manufacture of all our Memorials. We ‘pay attention to detail’, thus ensuring a high class finish and customer satisfaction. We dedicate time to our customers needs, ensuring that they have a full understanding of what is available/suitable in designs, emblems, etc., for their Memorial. 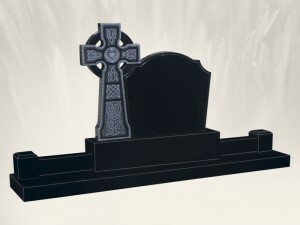 The finish on our Memorials, from production to fitting, is of the highest possible standard attainable. Inscriptions/names to be added to Memorials. Repaint of lettering on Memorials. Supply and fitting of kerbstones with corner posts, in Granite or Limestone to suit plot size. Supply ex-works or supply and fit, chipping stones for covering of plot.